When you’re looking for a Lawrence and Topeka orthodontist who provides the utmost in orthodontic care, you’ve come to the right place here at Hamilton, Wilson & Hendrickson Orthodontics. We don’t just want to provide excellent Lawrence and Topeka, KS Invisalign and braces treatments for you either – our assistance to you extends beyond just when you’re in our office. We’ll always be here for you when you need helpful advice or tips on maintaining your oral health and hygiene while you’re wearing braces. We understand that braces can make it much harder to clean your teeth, which is why we’ve provided these helpful oral hygiene tips for you. Your Lawrence and Topeka children’s orthodontist recommends all patients to brush at least two times every day for two minutes at a time, though brushing after each meal is preferred. When you brush, make sure to cover all tooth surfaces, including the outside, inside, and chewing surfaces. The areas where food is most likely to get trapped is between the wires and the teeth or between the gums and the brackets. Focus on these areas when brushing. First, place your toothbrush’s bristles against the outside of your teeth. Make small, circular motions with your brush to gently polish these surfaces clean. Tilt your toothbrush toward your gum line between your gums and the braces. Continue brushing in a circular motion. Clean the chewing surfaces of your teeth by using a back-and-forth motion. Brush the inside part of your teeth with either a side-to-side technique or a circular motion. Interdental Toothbrush – Also known as a proxabrush, this tool is excellent if you’re having trouble getting into the small spaces under wires and between the brackets or bands. An interdental toothbrush looks similar to a pipe cleaner though it has small bristles that stick out from the top and its sides. Oral Irrigator – Sometimes called a water pick, this is another helpful cleaning tool. It will shoot water out at a high speed, getting into hard-to-reach places in your mouth. As your Lawrence and Topeka children’s orthodontist, we highly recommend flossing at least once every day. 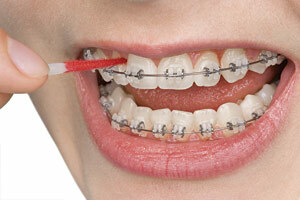 However, flossing can be difficult when you’re wearing braces, which is why we suggest using a floss threader. This dental tool will help you reach underneath the archwire of your braces. To use your floss threader, simply pull the floss through the threader and then pull the threader between your tooth and the corresponding bracket. Then, pull the floss between your teeth just like you normally would, making sure to floss both sides of your tooth. Continue performing this process for each of your other teeth as well. Contact Your Lawrence and Topeka Orthodontist Today! If you’re interested in Lawrence and Topeka, KS Invisalign or braces treatments, you’ve come to the right place! Feel free to contact us if you have any questions about our treatments. If you’d like to schedule an appointment with us, we encourage you to fill out our online appointment request form. We’re looking forward to hearing from you and helping you keep up an optimal level of oral hygiene!